PDC Series devices are systems that support the operator by digitizing and automating register and color matching, and quality checking work that used to be performed manually. Changeover time can be considerably shortened and paper waste significantly reduced by performing color control at print start-up with the Smart Feedback function linked to KHS-AI. 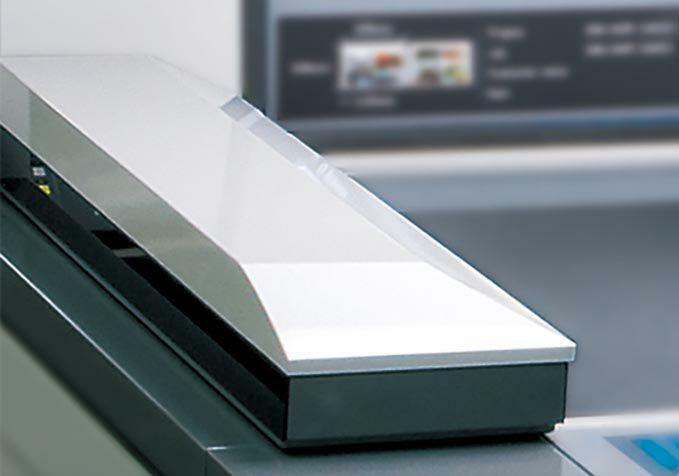 Compatible with ISO 12647-2, the international print standard, as well as G7 and JapanColor standards, the PDC system is indispensable for standardizing printing. PDC-SX adds an automatic registration function to the color control function so that both color and register are measured in one process and the information is automatically fed back to the press. Density, dot gain, trapping etc. A PDF comparator system that uses sensors to read the printed image for comparison with the originating PDF file data has been developed and may be specified with PDC-SX. This allows the operator to check for missing or added characters in the initial printing stage, preventing production losses. *PDC Series may be equipped only on certain models.